This summer a new detector company called Radenso entered into the US Market. Radenso is the US branch of European company called Genevo and their line of detectors has become one of the most popular detectors in Europe. Their first detector launched in the US market was their Radenso Pro and they have just released their newest detector the Radenso Pro SE. The Radenso Pro SE is the smallest, extreme range GPS enabled radar detector in the world and during testing we found that has over 8 times the capture distance of a police radar gun, placing it in our coveted 5-star category. The Radenso Pro SE is a GPS radar detector; enabling it to alert you to fixed photo radar and red light cameras, adjust its sensitivity based upon your speed, the ability to manually lock out known false alert lactations with the exact frequency and the ability to mark your own locations. 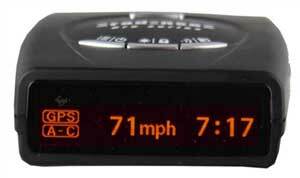 And unlike other radar detector manufactures that charge a yearly subscription fee, Radenso offers free lifetime GPS and firmware updates which you download from your computer. The Radenso Pro SE has selectable K and Ka band, tuned to the exact frequencies used in North America, enabling the detector to scan the police radar bands faster, while also reducing false alerts. The Radenso Pro SE offers three 3-sensitivity modes; Highway, City and AutoCity, when active will adjust the sensitivity of the detector based upon your speed. The Pro SE is equipped with a 2-level TSR filter (Traffic Sensor Rejection), enabling the detector to block out many of the false alerts caused by the anti-collision sensors installed in new cars. The Radenso Pro SE has a red OLED with seven display options that include Speed/Time, Speed/Voltage, Battery Voltage, Time, Speed, Speed/Compass. The Radenso Pro SE has easy to understand voice alerts, that first announce the band and then the detector will beep a series of tones, which will indicate the strength of the threat. The Radenso Pro SE is not stealth to the Spectre RDD (radar detector detector), however this should not be a big concern unless you live and/or drive in Virginia where detectors are illegal, or if your commercial driver. Which is evident in our testing videos of both the Radenso Pro and the Radenso Pro SE their display is difficult to see in bright sunlight. If you’re in the market for an ultra compact, extreme range windshield mounted GPS enabled radar detector then the Radenso Pro SE should be at the top of your list. Is this unit better than the Max 360? I’m looking for every day use (reliable, quiet, and better filtering). No, would say that the Max 360 is a better unit. I really like the small size compared to the Max360. I’ve been reading some reviews/videos on this unit and it seems the range is equal to the Redline. I’m hesitate to make the purchase because there also seems to be many complaints and reported bugs that need to be addressed. Are the free updates just for the GPS or is it for firmware also? Any advice or thoughts would be greatly appreciated!